All students are expected to follow all bus safety rules any time they are passengers in a District vehicle to ensure the safety of all. Relevant concerns may be addressed at the PUSD Service Center or at 717-3229. Remain seated at all times when the bus is in motion. Students will sit only in their assigned seats. Follow the bus driver’s instructions promptly. Keep hands, feet, and objects inside the bus at all times. Do not fight, scuffle, or be otherwise disruptive, loud, or boisterous on the bus. Do not use profanity or obscene gestures on the bus. Do not eat or chew gum on the school bus. Food can be carried in plastic containers ONLY. ONLY use emergency equipment, controls, or doors if it is an emergency. Keep aisles clear of legs, feet, and other objects. 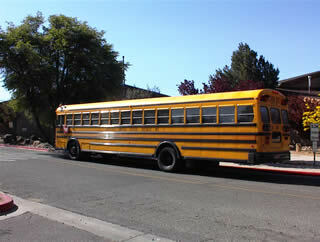 Students may not depart the bus except at their normal stop, unless written permission from parent is given. If a child must cross the road, he or she is to walk to the point about six steps in front of the bus, but is not to cross until the bus driver has signaled to cross. He or she will then walk DIRECTLY across the road, but will not run, watching to the left and right for oncoming cars. Students will not cross behind the bus. Service animals are welcome. All others are not permitted. Bus incident reports will be completed by the bus driver and used to notify the parent of a child’s unsatisfactory conduct. This form must be signed by parent and returned to the driver immediately.